Thrash titans ANTHRAX and TESTAMENT, who haven't toured together in more than a decade, are set to co-headline a US tour beginning Friday, October 14th in Grand Rapids, MI (itinerary below). Anthrax will close all shows, and DEATH ANGEL will be main support for the entire tour. 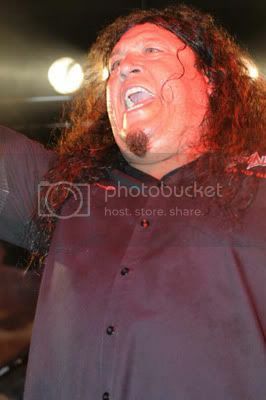 The coast-to-coast trek will figure to decimate more than two dozen cities over a five-week period, with both Anthrax and Death Angel debuting brand new material from their new albums, both set for summer/fall release; Testament's new album is set to be released in 2012. The Anthrax fan club pre-sale begins today at AnthraxArmy.com, and the public on-sale kicks off Friday, September 9th at 10 AM local time. "We've been tight with the guys in Testament for a long, long time," said Anthrax's Charlie Benante, "so we're really looking forward to hanging out with them on the road. And all of us in Anthrax are big Death Angel fans, so this is going to be a monster of a good time - for all of us and for the fans. Plus, with the incredible success of The Big Four shows over the last year, we wanted to tour with some of the 'second wave' of thrash bands." The tour will follow Anthrax's Big Four "hometown" appearance at Yankee Stadium on September 14th, with METALLICA, SLAYER and MEGADETH. "We're excited to do this tour because Anthrax was actually the first band we ever toured with," adds Testament vocalist Chuck Billy. "It's an accomplishment 20 odd years later that we're going to do it again. The tour kick-off date is actually about five days difference from the kick off date of the first tour 20 years ago. The first time we performed with Anthrax, we only had a total of ten songs, so obviously now we have many songs to pick from so it will be very different. It's good to see that a lot of the faces in the bands are the same as back when we first did this original tour 20 years ago."